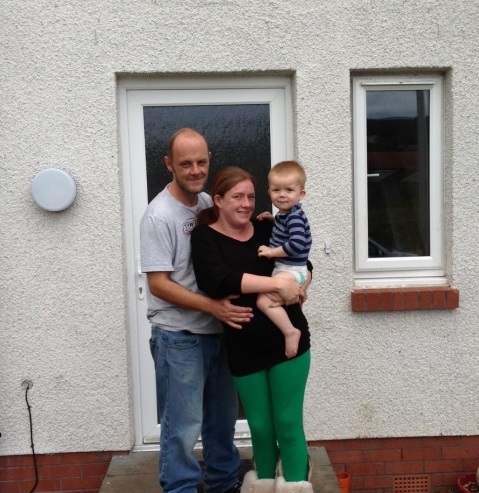 Sabrina was referred to our service for independent housing information and advice having spent 18 months in temporary homeless accommodation in Glenrothes. Due to the size of the property required for the needs of Sabrina and her family, the only suitable temporary homeless accommodation that could be provided was outwith the required specified areas of choice. Sabrina and her family became homeless after her private landlord served notice to quit in order to sell the property they were living in. Only during full housing options was MMR identified as a potential housing solution which the family had no knowledge of, prior to registering with our service. Nov 2012 Full housing options interview and report compiled to show all housing options available to customer for consideration and housing need highlighted to all FHR partners and local office staff at Fife Council. Dec 2012 Referral to Specific Needs Housing Group for assistance due to property size required for customer’s needs. All housing options fully explored with customer in order to return to specified areas of choice such as private renting and mid market renting. Jan 2013 Customer’s housing need highlighted to relevant housing providers and local office staff at Fife Council. Feb 2013 Info sent out to customer on mid market renting properties at Lochore via Ore Valley Housing Association and meeting arranged with housing provider. This area being one of those specified on their FHR application. Feb 2013 MMR housing offered by Ore Valley HA to customer – housing solution obtained – case closed .